Each of the thousands of objects in our collection has a story behind them. Ideally, our staff records that story at the time the item is donated—but sometimes we have to uncover the story ourselves, even after more than 100 years have passed. These “history mysteries” are a challenging but fun aspect of museum work. Several years ago, our archives staff discovered a handwritten Civil War poem titled “For Country.” It was written by an unnamed mother in Milwaukee praying for the safety of her son, identified only as a 1st Lieutenant in the Heavy Artillery, who was going off to war. The poetry was beautiful, but what caught our attention the most were three odd holes down the center of the paper. Who was the mother? Who was the soldier? And what had caused those holes? One staff member remembered a set of five business card sized photos—cartes de visite—with similar holes in them. Could they be related? One of the photographs, showing a middle aged woman, was labeled on the back as “My Mother, Mrs. Charles H. Larkin, Milwaukee.” Could that be the mother who wrote the poem? A search of the roster of the 1st Wisconsin Heavy Artillery, referenced in the poem, revealed a 1st Lieutenant Courtland P. Larkin from Milwaukee, who was later promoted to Major of the 38th Wisconsin Infantry. 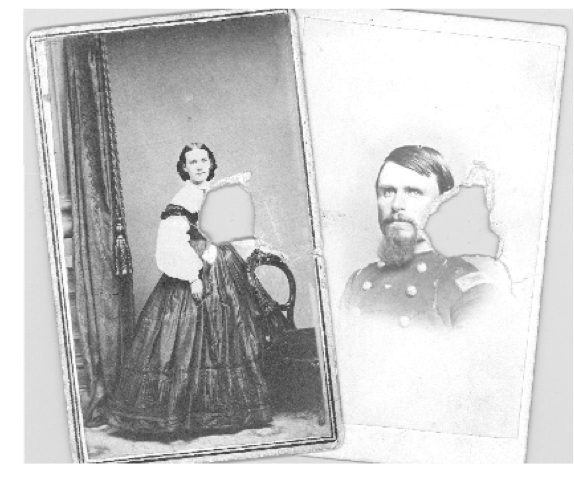 This evidence suggested the identities of the mother and the soldier, but we still wanted to know what had caused the holes. Staff located a regimental history of the 38th Wisconsin Infantry, written in 1866, which included short biographical sketches of the officers. Larkin’s included the following account: “He took part with the battalion in the battle on the Norfolk railroad, June 17th, 1864, and was severely wounded by a musket ball which entered his left side, between the ribs and hip, and lodged internally, where it still remains.” We then realized that if we folded the poem, the three holes aligned into one and if we placed the cartes de visite next to it, their holes also aligned. Clearly, Courtland Larkin received the poem and photos from his mother when he joined the 1st Wisconsin Heavy Artillery in September 1863. He carried them with him throughout his service and had them in his coat pocket on June 17, 1864, when a Confederate musket ball pierced them before lodging in his hip. Larkin, who survived the serious wound, died in 1920 and is buried in Forest Home cemetery in Milwaukee. Our expert staff, together with the rich historical resources available at WVM, were able to bring the story of Courtland Larkin back to life through the poem and photos he carried 150 years ago. Thousands of other stories are also preserved through the objects that are donated each year. Visit the museum or search our online catalog to discover them.